Lil' Chief Records: Princess Chelsea - The Cigarette Duet, now on 7" Vinyl! 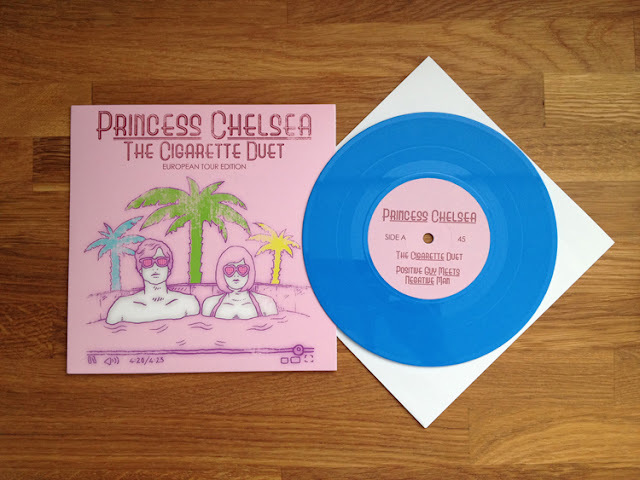 Princess Chelsea - The Cigarette Duet, now on 7" Vinyl! Today we are proud to bring you the first ever Lil' Chief Records 7" (we're not counting the almost mythical first release by The Brunettes). Perhaps unsurprisingly, it's for the insanely catchy The Cigarette Duet by Princess Chelsea. Pressed on beautiful opaque blue vinyl and with a drawing by Harlequin Jones on the cover, it's limited to 300 copies, however we have just 100 copies for the web store as the band will be offering the rest on the merch table at their shows. You can have a listen here [Bandcamp], or here [SoundCloud], or at the bottom of this post even. The digital version comes with a bonus radio edit of The Cigarette Duet (you get the digital version when you buy the 7" anyway). The 12" pressing of Lil' Golden Book on gold vinyl sold out, so be careful that you don't miss out this. Oh, and you can also download a free Princess Chelsea track via the recently released Lil' Chief Records mixtape - These Shaky Isles.